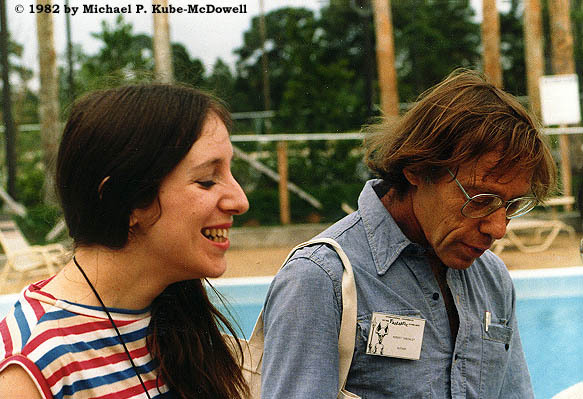 Robert Sheckley with his fourth wife Jay Rothbell in 1982. Science fiction writer Robert Sheckley died on Friday, December the 9th, 2005. 28 days earlier he was stricken with a brain aneurysm, and in his final days he went into a coma from which he never awakened. He passed away in hospital in Poughkeepsie, New York, aged 77. Sheckley, who lived in Portland for almost 20 years before moving in 2003, had a variety of health problems, from late-stage emphysema to heart attacks, but had rallied from them all. He made headlines in May when he collapsed with a severe cold while in Kiev, Ukraine, where he was the guest of honor at a convention of science fiction writers and fans. He contracted pneumonia, fell unconscious and remained gravely ill for a while but recovered enough to be flown to his daughter's home near Pine Plains, New York. He regained his vitality in New York and was in communication with friends and family, including his wife, Portland writer Gail Dana. He lived in an apartment in Red Hook, about 20 miles from his daughter, Anya Sheckley. The day he suffered his aneurysm, he had hiked into town with his ever-present backpack full of books. The family of Robert Sheckley is strongly moved by the appreciations and tributes of his readers all over the world (and so many caring ones from Russia and Ukraine). At Bob's funeral, his son Jason Sheckley read the short-short story Beside Still Waters. His daughter Alisa Kwitney delivered a eulogy, as did writers Barry Malzberg and Michael Swanwick. Daughter Anya Sheckley read from The Garden of Proserpine, by Swinburne--a favorite poem of Bob's. And Kaddish was recited. Son Jed and grandchildren Matthew and Elinor Stapylton were present. It was a good send-off. Mr. Sheckley's marriages to his first four wives, Barbara Scadron, Ziva Kwitney, Abby Schulman and Jay Rothbell, ended in divorce. At the time of his death he was separated from his fifth wife, Gail Dana. He acknowledged that being married to him could frustrate a woman but wrote of Dana, "I can't imagine life without her." He had four children: a son, Jason, from his first marriage; a daughter, Alisa Kwitney, from his second marriage; a daughter, Anya, and a son, Jed, from his third marriage and three grandchildren, all of whom live in the New York region or New England. He is also survived by a sister, Joan Klein of New York. This extended obituary combines two other excellent obituaries. One from the New York Times by Gerald Jonas, the other from the Oregonian by Mike Francis. I have also included the statement from Ziva Kwitney posted on www.sheckley.com.